TechBrite’s LED Vaportite High Bay Advanced can take on the toughest environments. 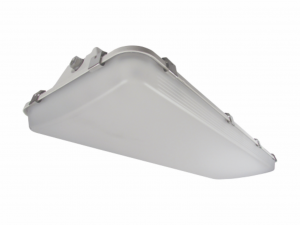 Rated IP67, the LED Vaportite High Bay Advanced is designed to minimize the retention of liquids or debris when hosed down. The standard stainless steel hardware makes it an ideal solution for most environments and is an ideal replacement for metal halide or T8 fixtures. Simple mounting system—no holes to drill!